With the college football season upon us and planning for our opening weekend tailgate at Auburn University tomorrow it made perfect sense to keep the Friday Find in line. At this point, are there really words that can describe the perfection of a Tailgating Innovations set-up? Tailgating is a fine social event at football stadiums across the nation and in the South, it becomes an art. For a football nut like me, the only drawback to tailgating from sun-up til game time(which we plan to do tomorrow, with a 6pm local kickoff) is that I'll miss all the other games going on throughout the day. 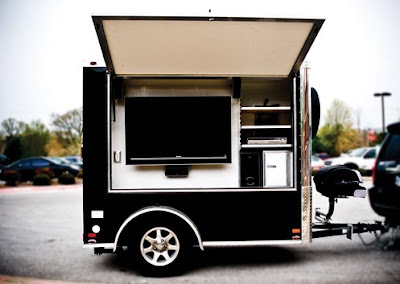 The Tailgating Innovations trailer prevents the hauling of one's tv to campus for the day... very nice. 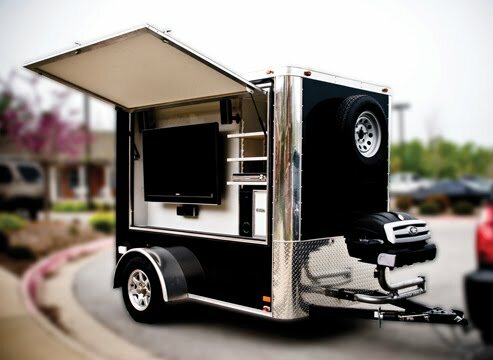 Featuring a 47" HDTV as the centerpiece of the tailgating luxury, the trailer also has a grill on a 180 degree swing-arm, lots of cabinet storage inside, electrical outlets, Sony surround-sound system and a pre-wired satellite system. Stock the trailer up at home and the trip to and from the game gets lots easier. Sure would look good in orange, eh? 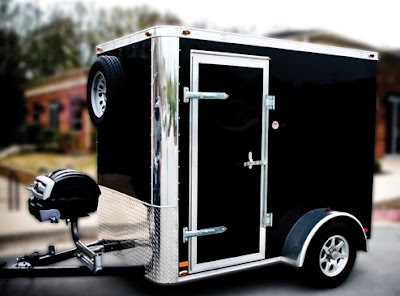 You can talk with the folks at Tailgating Innovations and get your tailgate set-up here. Prices start in the $12,500 range. If you will be in the Auburn area tomorrow let us know! We'd love to meet you and I'm sure that we could find a koozie to fit your favorite tailgate beverage. Happy Friday everyone... Football is here! We will be there!! Can't wait to get the tent up and start the party! We are actually going down tonight since my parents live down there. That is a super fancy tailgate thing - I wish we had a tv, but someone in the parking lot usually has one for us to catch a glance at a good game. Awesome, Steph! We are usually over near Ag Heritage. If you're on Twitter tomorrow, hit me up and come get some Koozies. OMG. 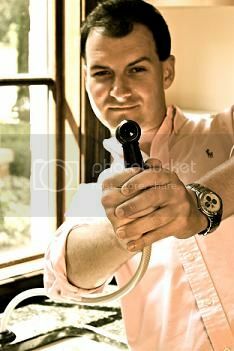 You have officially gone over the edge. Although I do love the color orange. Will that thing fit on the back of your bike? Ooo or some YELLOW stripes. and a giant Yellowjacket on top. With a strobe. Becky- Actually I agree... I think a team customization would make it all the more impressive.